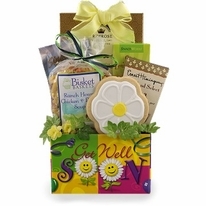 These buzzing bees are sure to make the recipient of this Bee Well Cookie Bouquet feel better as soon as they receive it! 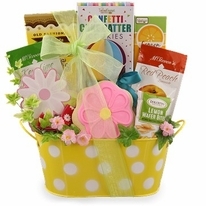 This cookie bouquet is filled with beautifully hand decorated cookies that are made with fresh, quality ingredients. Our cookie recipe was developed by a world-renowned French pastry chef! 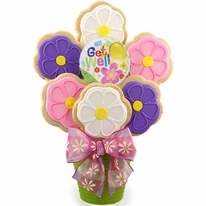 Our Cookie Gift Bouquets are made of delicious cookies and individually hand-decorated by an icing artists. Our cookies measure approximately 4.5" each with limited exceptions. 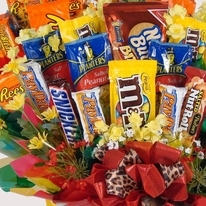 Each bouquet is hand wrapped and packaged with delicate care to insure it arrives safely into your recipient's hands.